The Water Margin offers the finest Oriental cuisine in unpretentious surroundings with a warm welcome and friendly and attentive service. 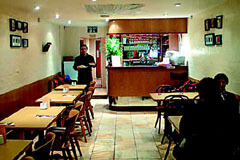 This neighbourhood restaurant, owned and managed by Tony whose family established their reputation in Walton on Thames over the past 35 years, offers a range of Oriental dishes to eat in or take away at extremely reasonable prices – for example the set lunch menu is only £3.80 for two courses. We at the Water Margin offer an exciting new dimension in oriental cooking for you to enjoy on the premises or in the comfort of your own home. All our dishes are prepared by our experienced chefs using fresh and fine meat and vegetables. We take great care in packaging your take-away to ensure the highest standards are maintained. Open Tue-Sat 12-2pm and Mon-Sat 5.30-11pm (closed Sunday). All major credit cards accepted (not Amex/Diners). No service charge. Available Mon-Thurs evenings, this menu offers a great selection of dishes for only �9.95 (children �4.95). See our menu pages for details. The Water Margin specialises in the finest Oriental cuisine with influences from China, Malaysia, Singapore and Japan.